In between juggling three loads of laundry, baking four “pumpkin” pies with the last root-cellared butternut squashes, and watching the home yard hive for swarming (better go in tomorrow and have a look! ), I finally got the Michael Philips Holistic Spray onto the garden today. A bit late: the sour cherry, currants and jostaberry are flowering, the elders, blueberries and grapes are about to pop. But no insect damage yet, anywhere, so I may have caught it in time. I use the Home Orchard Rate recipe in my 4-gallon backpack sprayer. One gets me through the entire garden, and it takes me about two hours (admittedly because the filter on the sprayer wand needs unclogging so often). I also added a tablespoon of home-made OHN, and a tablespoon of WCa… that is, Water-soluble Calcium, another Korean Natural Farming input I’ve not explained yet (basically, eggshells dissolved in vinegar). 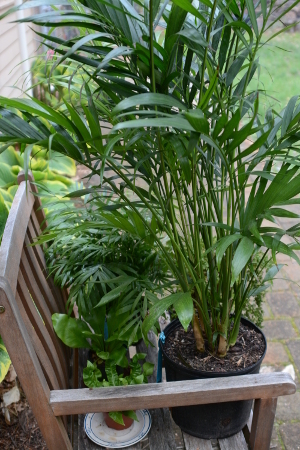 I also sprayed the assortment of indoor plants, mostly ferns, (pictured) while I was at it. The largest fern adorns our bathroom and it’s great only… it is growing exponentially! They’ve been with us throughout winter and we’ve not had a bug problem, and have 0bviously thrived, thanks to a mini-holistic spray once a month.